Abstract: Objective To evaluate the association between tumor tissue CD45RO expression and the clinicopathological properties and prognoses in surgical patients with lung adenocarcinoma (LAC). Methods One hundred and twenty-one patients with LAC were recruited for the study. LAC tissues and paired adjacent LAC tissue samples were collected. 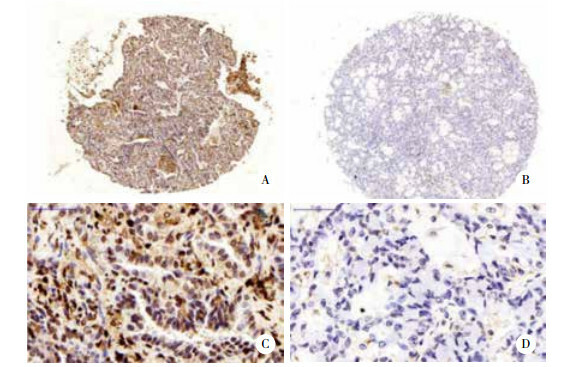 CD45RO expression was evaluated based on immunohistochemistry. Results CD45RO expression was higher in tumor tissue samples than in paired adjacent LAC tissue samples. Tumor tissue CD45RO expression was positively associated with tumor size but was negatively associated with lymph node metastasis (LYM). Kaplan-Meier curves revealed that high tumor tissue CD45RO expression was correlated with better disease-free survival (DFS) and overall survival (OS) compared to those of low tumor tissue CD45RO expression. Univariate COX regression indicated that high tumor tissue CD45RO expression predicted prolonged DFS, while poor differentiation, LYM, and tumor-node-metastasis (TNM) stage predicted worse DFS. Multivariate COX regression revealed that high tumor tissue CD45RO expression was an independent protective factor of DFS, while poor differentiation and LYM acted as independent risk factors of DFS. Furthermore, univariate analysis indicated that high tumor tissue CD45RO expression predicted prolonged OS, while poor differentiation, LYM, distant metastases, and TNM stage predicted worse OS. Multivariate analysis revealed that poor differentiation, LYM, and distant metastases acted as independent risk factors of shorter OS. Conclusion CD45RO expression could serve as a novel and convincing prognostic biomarker in surgical patients with LAC. OSINSKY S, KOVELSKAYA A, BUBNOVSKAYA L, et al. CD8 and CD45RO T lymphocytes in bone marrow of gastric cancer patients:correlation with disseminated tumor cells and disease outcome[J]. Exp Oncol, 2015, 37(1): 48-52. RANGEL R, ROCHA L, RAMIREZ JL, et al. Generation of memory CD4+, CD8+, CD45RO+ and CD16-lymphocytes activated with IL-2, INF-gamma, and TNF-alpha with specific cytotoxicity against autologous cervical cancer cells in a mixed leukocyte-tumour cell culture[J]. Eur Cytokine Netw, 1995, 6(3): 195-202.